Receive guidance and inspiration a couple of times a week in your inbox. Free parenting tips give practical suggestions to help you relate better to your kids and help your kids change their hearts, not just their behavior. If you're in ministry, use the tips in bulletins, newsletters, or post them for parents. The tips are gleaned from the live seminars and articles of Dr. Scott Turansky and Joanne Miller, RN, BSN. Here's what parents are saying about these short words of encouragement. "We have a three year old and an eight year old, and so many tips apply to both. It's exciting for me when God delivers a tip on something we're struggling with and I'm able to share it with my husband. It get's conversation started and good things happen." "Just wanted to let you know what a blessing your parenting tips have been to me and the others I share them with. I make hard copies of them and also save them on file. They truly help me and other parents learn practical and biblical principles of parenting." "These tips are very helpful and actually seem to come at a time when I need them. I have three teenagers ages 16, 14, and 13, so I always need help with something." Sign up for free email parenting tips now. You can remove yourself from the list at any time. Your email address will not be shared or sold to others. 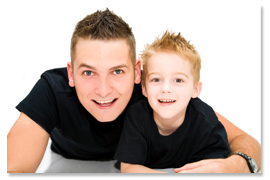 To receive Email Parenting Tips in Spanish, click here. Use this link on your web page to link to this page. For more banner choices click here.